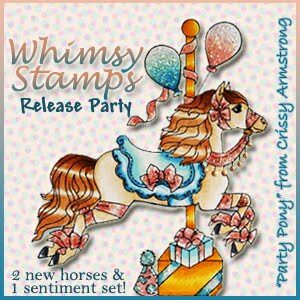 Stamps: 'Proud to Be', avaiable HERE at Whimsy Stamps. Paper: 'Cupcake' by Basic Grey. Copic Markers: E29, E33, E35, E37, E50, E51, E53, R27, R29, YG03, YG63, YG67, B32, B39, B45, Y15, Y17 - available HERE from Dies to Die For. Tools & Embellishments: Adhesive pearls from stash. Now, do you want to hear the really good news? I've got one of the new sets to give away! All you need to do is leave a link below and I will draw a winner on the night of Friday 21st May. Thanks for stopping by today and for your love of all things Whimsy! Wow, that is a great card. I love all the red white and blue. What a happy horse! I'm lovin' the bright colors you have used! Thanks for sharing, and for the chance at a bit of yummy candy! Beautifully coloured and coordinated work. heheeeeee that is Jazzy and i love it ! what fab colours you have brilliantly mixed , fantastic colouring and your horse looks awesome ! Very vibrant colours... I love it! What a great card! Out of all the beautiful creations on this blog hop, your coloring of this carousel horse is my absolutely favorite - FABULOUS! Great card Stacey. Love how you colored him and great LO. This is gorgeous, Stacey! The horse is colored up so beautifully and I really love the clean look of your card. It showcases the images so well! Love it! Fantastic Stacey, Great papers and lovin the layout!!!! I love the expression on his face! Gorgeous card! Super card, love the papers and image. Great card, love the papers you have chosen. Stacey the combination of patterned papers and the colors you used with the stamp simply stunning! A fabulous card Stacey! Love the colours! great card - love the lively colours and papers you used! Just love everything about this card! Thanks for the fun on the hop! Very cute card and love the carousel images. Great for kids parties invites or birthday cards. Stacey what a gorgeous card hun! Your coloring is fantastic! Great work! I just love your coloring of this Stacey!! Very vibrant and beautiful!! Great design!! Wow, so gorgeously coloured! I love this combination! The whole card is beautiful! Cool horse! I loved how you colored him! Beautiful colors and card! Nice design! LOVE this card! The colors that you used and the paper are so bright, happy and cheerful! Would love a chance at the candy, but being blogless, I can't use the linky. Oh well, guess I'm SOL! Still love the card that you created! Great Funky card, love the color choices. I love how you added the green to this red, white and blue horse. It really makes it stand out! Great card! I love how you colored the horse. I love the color of the papers you used. Great card. Thanks for a chance to win some candy. Hi awesome creation stunning colour combo great colours & layout love it. 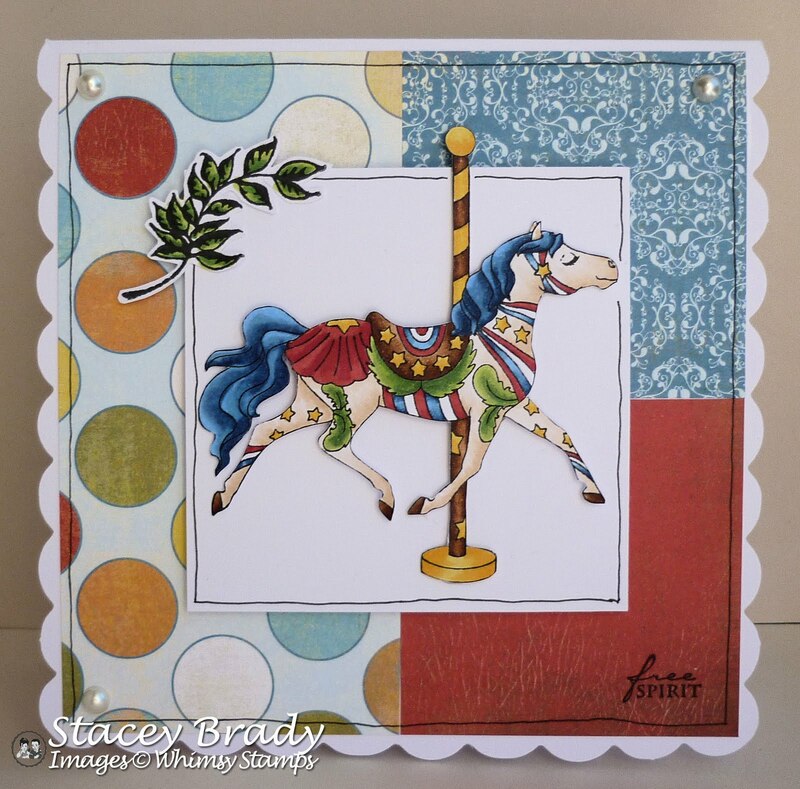 Wow Stacey......such a gorgeous card with that beautiful new horse.......your colouring is great!.....love Ann's sentiment too! Great creation, love the DP used! Gorgeous card! I love these papers and colors. Stacey, this is such a fun card. Great for anyone. Gorgeous card -- love the regal blue mane. Oh how adorable, love it! Love your papers, and your bright colors. love the card! you do such a great job! thanks for sharing!